CGI brings your products to life in clean, crisp detail. It sets them apart from the competition. They can be shown in a studio or a real world-environment, and as still images or animated movies. CGI is also very cost effective over the long term. Once produced, the assets are yours in perpetuity. So, when assessing the cost of CGI, think of all the years it can be used – for a cost to just one year’s budget. What’s more, the sheer flexibility of CGI removes real world restrictions. The various effects that can be employed are only limited by your imagination. For example, make a product transparent and you can see inside, observe working internal parts and understand how components fit together. Liquid and gas flow can be seen moving through pipes, and time made to slow down or stop completely. These are just a few effects – there are a whole host of others, all at our finger tips. If your product is too big or heavy to take to a studio, or too small or cramped to be effectively photographed, CGI can be the only option for creating commercial quality images. CGI video also transcends language. You can show a product and how it functions without the need for verbal communication. This removes the need for translation, and saves costs in time and money. With CGI, variants on an original design are extremely cost effective to produce. This is because much of the work has already been done modelling the original asset. Colour and other variations can be achieved in no time at all. 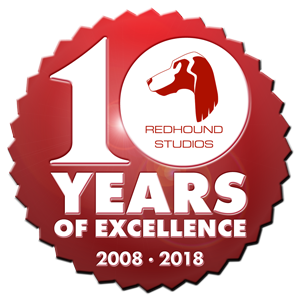 At Redhound Studios, we store your data for future changes so there’s no need to start from scratch when improvements are added to existing designs. Digital data does not fade or deteriorate over time, while revisiting existing files for updates is simple and can be done at any stage. This is ideal if you develop multiple designs over an extended period, as you can keep track of all products both current and in development. Many Redhound clients use CAD for manufacturing, then create renders or ‘finished digital images’ in CAD, however, the quality here is seldom good enough for commercial use. Which is where we come in. CAD technicians and engineers have little time to devote to a process they will rarely use, it’s simply too peripheral to their core duties. Why should you waste time and spend money training an engineer to be an artist, when you can bring in an expert graphics studio to give you what you need? We take the completed CAD files and use them in our 3D software to ensure forensic accuracy. We then add stunning realism with highly accurate colouration, surface finishes and realistic studio lighting. Companies everywhere, large and small, are now seeing the enormous value that CGI services can offer. This is crucial when selling products is fiercely competitive and acquiring funds for projects challenging. The benefits are many, while it’s fast becoming an expectation to produce them – and not always for obvious reasons. CGI’s undisputed power in making make your product presentation more dynamic and effective is old news. However, it’s not just about pretty pictures. Smarter organisations look beyond for the real benefits. Many companies have great ideas, but require investment to succeed in manufacturing and marketing their products. The problem is raising interest from investors with a limited initial budget. When seeking funding, CGI has been proven to be the preferred method for some time. Presenting professional visuals to potential investors and stakeholders yields a much higher rate of success. Investors need visual representation of a proposal to make a rapid and informed decision. CGI can expedite the decision-making process, and be the difference between success and failure. Whether it’s showing a newly proposed building seamlessly integrated into its surroundings, or displaying exactly how a product will look, it’s vitally important to show a product in the best possible light. Beyond the figures, no investor wants to be presented with technical drawings, spreadsheets and data they have to interpret themselves. They want to know ‘what it does’, ‘how it does it’ and ‘what it looks like out of the box’. The same goes for a buying public for whom consumption starts with aspirational images. You owe it to yourself and your company to give your idea or concept the best chance of success. Which means you need to consider CGI. At Redhound we can create imagery of any physical product in photorealistic detail – without the presence of a real model. This means marketing material, from brochures to TV commercials, can be created in advance of the finished product being available. In fact, in the case of architecture, properties can be sold before even a single brick has been laid. For other products, as advertising campaigns can be initiated much earlier, you can significantly shorten the lead time between design, production and marketing. In relative terms, the modest cost of CGI is far outweighed by the lag caused by outdated linear production processes. Your competitors are using CGI. Don’t you think it’s time you were? Call Redhound Studios to discuss you needs. We are here to help you succeed.